If you’ve ever dreamed of living in a beautiful manicured park-like setting on Long Island’s North Shore, Willow Lake is your dream come true. Whether you are saving up for your first home, or enjoy a chore-free lifestyle, Willow Lake offers its residents something truly unique: a lifestyle of luxury and convenience. Built and managed by the award winning creators of The Harbour Club, this luxurious rental community is nestled between gently rolling wooded hills and a tranquil lake. For many residents, it is the superb service that sets Willow Lake in a class by itself. The staff is made up of top-notch professionals who take pride in the community’s reputation for service. 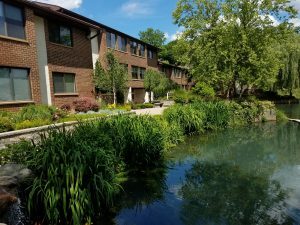 They are the people who maintain the residences, tend the gardens, shovel the snow, and ensure that you are free to enjoy the best of life at Willow Lake. With location being key, Willow Lake is close to major shopping malls, fine dining and the Long Island Sound, and with easy access to Long Island’s parkways, Willow Lake offers the very best in North Shore living. If life in an elegant, secluded community fulfills your vision of an appropriate lifestyle, Willow Lake is precisely what you’ve been looking for. Come see for yourself.